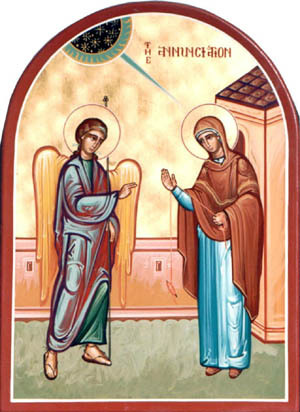 Today is the feast of the Annunciation — March 25, nine months before Christmas. It is the day when we celebrate the story of the Angel Gabriel’s appearance to Mary, a teenaged girl, engaged to be married. The story tells us that Mary had a vision in which she was invited to become the mother of Jesus, and somehow, she was able to say “Yes” to this invitation. And having done so, was “overshadowed” by the power of the Holy Spirit and conceived a son. For most Christians, for most of Christian history, this story has placed Mary in a most exalted position in the life of the church. Most of the world’s Christians today are either Roman Catholic or Orthodox, and both of these traditions have long held Mary in high esteem, as do some strands of the Anglican/Episcopal tradition. Protestantism felt that people had gone a bit overboard where Mary was concerned, and so her devotion was mostly eliminated from the Protestant tradition. But globally, this position is a minority perspective. Much of the Christian veneration of Mary has tended, in my view, to miss the point. Great focus was placed on her “perpetual virginity”, particularly in the Roman tradition, and much ink has been spilt over the question of how she could have become pregnant without the participation of a male human. Despite the assertion of multiple gospels that Jesus had brothers and sisters, theologians managed to explain their presence in ways that prevented Mary from being their mother (again, the preoccupation with her virginity). In the process, Mary became a woman removed from the life of the women of her time or any time. She became rather precious, and was advertised to Christian women as a model to be emulated: a pure, passive, life-carrying vessel. Indeed, the Roman tradition went so far as to proclaim the doctrine of the immaculate conception, which sought to exempt Mary from the usual human failings that fall under the general category of “sin” (a doctrine, incidentally, that the Orthodox Christian tradition has not accepted). This great perfumed cloud of the Marian tradition has obscured what to me is a far more powerful story. But just as the gospel stories about Mary’s conception of Jesus required a bit of imagination, this alternative story requires some, as well. I imagine Mary as a young girl, as she surely was, in a culture where young women were married far earlier than our current Western standards would consider appropriate. Her family had arranged for her to be married to someone whose family they knew, named Joseph. It’s likely that she knew him in some way, but also quite possible that she didn’t love him — love was not necessarily a part of the marriage equation in Mary’s time, though it was to be hoped that when a match was made by the families involved, the two might grow to love each other. Perhaps there was a different young man, someone her family regarded as unsuitable, who loved her and whom she loved. And they did what young people did and do, still. Only Mary became pregnant — and her world turned upside down. For this, she could be cast out of her family. For this, her arranged marriage — her safety net — would be called off. For this, she could be killed. She found herself in the most vulnerable position a woman of her time could inhabit. It must have been terrifying. But into the midst of this terror comes the voice of God, whispering to her something quite different than her culture and her religion would have led her to expect: “Blessed are you, Mary. And blessed is the child you carry.” How is this possible, she must have wondered. I have sinned, I am condemned, I am the very definition of shame. This is what my culture and my religion tell me. “No, Mary. You are still my child. My power will overshadow you, as it has from the first moment of your existence. My Spirit is with you. The child within you is holy — and he will show the world that those whom the world casts out and condemns are loved by me, for all are loved by me. Do not be afraid; have courage.” And she said, “Yes. May it be this way with me, as you have said. I will trust in your love, and I will trust that from what seems like a disaster will come forth something beautiful.” Joseph, too, heard this voice, and he said, “Yes,” and delivered Mary from that place of dangerous vulnerability. And that, perhaps, is when they began to love each other. There are those who will undoubtedly object that I have made this up — it is not, after all, the story of the church. And I’m fine with that. I have allowed my imagination to “play” with the traditional story of Mary, and allowed it to lead me to, what for me, is a more powerful narrative. My personal comfort in doing so is rooted in a deep conviction that the traditional story is also made up, or mostly so. Many years passed after the life, death, and resurrection of Jesus before people became interested in stories of his birth, and when the traditional story reached the form we have it in now, it was not understood to be a factual account. Rather, like most biblical stories, it was told to bring out an inner truth about the relationship between Jesus, God, and Mary. The inner truth that I think the story of Mary points us toward is that Jesus, who for us is the Word of God made manifest in a human life, who for us is the most sublime, most profound revelation of God, is someone who comes from the margins. Whether by the Holy Spirit or a youthful indiscretion, Mary was pregnant without benefit of marriage, and she was in danger. She and her baby were saved because of a delicate choreography that involved a great act of courage both on her part and on Joseph’s part. They both had to step outside the norms, expectations, and rules of their culture, and that involved great risk. And, through it all, they held on to the conviction that God was with them. It is the same pattern that we see lived out in the life of the adult Jesus, as he devotes so much of his life to affirming people on the margins. Time and again, he tells those who are culturally defined as outcast or unclean or condemned that they are loved, that they are blessed, that God is with them. He becomes the incarnation of the Word that Mary and Joseph heard whispered in their restless sleep: “You are all my children. My power overshadows you, as it has from the first moment of your existence. My Spirit is with you. You are loved.” When we consider the story of Mary, how could Jesus have been anyone else? She undoubtedly whispered this Word into the ears of her son from the moment he was born. As we celebrate Mary, we celebrate her as a courageous woman who trusted that God was for her more than she feared that her culture was against her. We celebrate a woman who trusted that beautiful things can emerge from what the world sees as disastrous. Before Jesus changed the world, Mary had to believe the world could be changed. Without Mary, there is no Jesus. She is not simply a vessel who passively allowed God to use her. She is a courageous young woman whose strength of soul and spirit must have been profound. From this day all generations will call me blessed: * the Almighty has done great things for me, and holy is his Name.